Today was, I think, the warmest day this year. At least 15degC. So, it was time for the peas to leave their home in the greenhouse for the allotment. A row of peas had been planted already, but the birds seem to have had a nibble, well more than a nibble and some of them are little more than shredded stumps, so a bit more protection was needed. 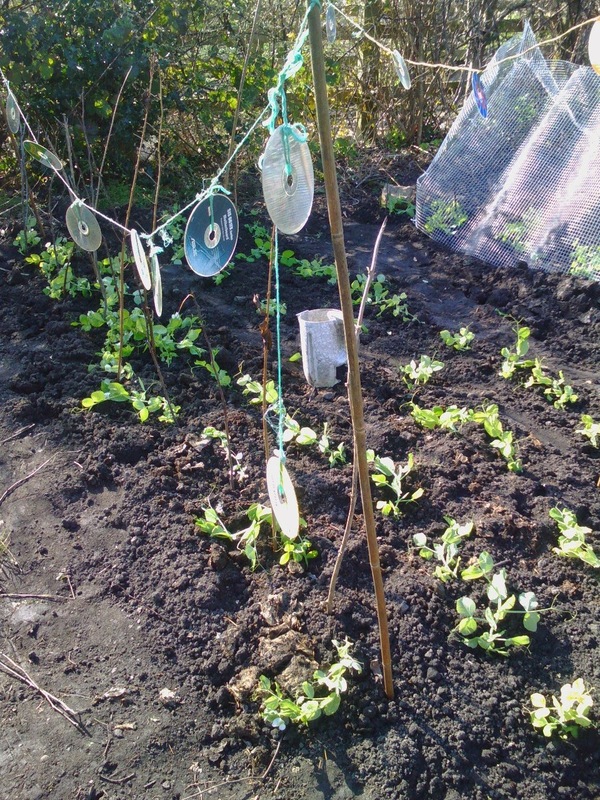 I can't take credit for the construction, my youngest daughter and my wife were busy as well with the CDs and the mesh, though I went round after this photo was taken to put in lots of twiggy sticks for the peas to climb up. Some of the peas are already flowering! So, I have sprayed with an organic garlic spray to stop pea moths from laying eggs, and therefore peas getting maggots in. Also, as well as a generous compost dressing (manure was spread over the patch at the end of last year), and then some organic, wildlife friendly slug pellets.